There’s an interesting phenomenon taking place that so many people are really beginning to enjoy. The phenomenon we’re talking about is all about becoming a master mixologist even if you are nowhere near a professional. You can create professional style mixed drinks right in the comfort of your own home, your friend’s home, your backyard, or anywhere else you may decide to have fun, exciting, great tasting mixed drinks. How is this possible? It’s possible with a monthly subscription service known as Saloonbox. When you have Saloonbox coming to your door every month, you’ll get seasonal recipes, hard-to-find ingredients, and you’ll have no problem becoming one of the best mixologists amongst your family and friends. People will gladly come to you to have you mix their drinks because they know they’re going to get something exotic, flavorful, exciting, and off the charts awesome once you start mixing drinks for everyone. There’s so much to a Saloonbox subscription that we want you to fully understand what it’s all about. Because when all is said and done, if you truly want to become an expert mixologist to get hard-to-find ingredients delivered directly to your door, you’re going to need the help of a subscription service like Saloonbox. So it’s definitely worth it to join up if you really want to impress your family, friends, and become the talk of the town as far as mixing drinks is concerned. So, without any further interruption, we’re going to tell you all about the Saloonbox subscription and hopefully you’ll see why it’s such a great investment. At the end of the day, if you’ve ever wanted to become the life of the party, this subscription is definitely going to help take you there. So you’ll find that it’s worth it more than anything else in the end. How Does the Saloonbox Subscription Work? Before you invest in a subscription service like the one we’re going to tell you about, it makes sense to find out more about how it works. So we’ll fill you in on the details right now. To start things off, the first thing you need to do is pay a visit to the Saloonbox online store. Since there is more than one option and there is even more than one type of subscription plan, you’ll need to figure out which plan makes the most sense to you. Where to Buy SaloonBox? Online – – – > Click here. The month-to-month subscription – if you sign up for the month-to-month subscription, it will cost you $37.50 per month. All the subscriptions give the same things, but they vary because of the way you pay. Some subscriptions will provide more savings than others. The three-month prepay subscription – when you sign up for this subscription, you will pay three months in advance. The total comes out $112.50 per three months, which works out to $37.50 per month. So you really aren’t going to get any major savings with this plan over the month-to-month subscription. The six-month prepay subscription – by signing up to this particular subscription and payment plan, you will have to pay your bill once every six months. So your total for the six-month subscription comes up to $213. When you break this down on a month by month basis, it only costs you $35.50 per month. So you’ll save $12 in total and two dollars a month. It’s definitely a better deal if you have the money and really enjoy the mixologist boxes every month. The 12 month prepay subscription – with this subscription, you’re going to pay for the entire year upfront. This option provides a deeper discount than any other option available on the site. Your total for the year will cost $402 that you have to pay in advance. When you break it down on a month by month basis, you only have to pay $33.50 per month. So subscribing and paying this way is the least expensive and it will save you $48 per year or four dollars per month. Clearly, having so many payment options makes it possible for everyone to subscribe to this awesome mixologist delivery service. Saloonbox is definitely something you’re going to find yourself interested in if you like to mix drinks at home, host gatherings, and really impress your friends and family members. What’s inside a Saloonbox Subscription Box? Now we get to the good stuff. Now we cover exactly what you’ve been waiting for all along. You’re about to learn what’s inside the Saloonbox subscription box and what you’re going to get every month. Isn’t this exciting? Well, since they change the box of every month, it’s hard to tell you exactly what you’re going to get on a month by month basis since it’s going to change. But we’re going to share some of the things they’ve delivered over the course of their existence in the monthly boxes. This should help you get a good overview of what you’ll receive when you join the subscription service. In October 2017, you’ll receive the ingredients to make a Maple Bourbon Smash. The box contains Highland Park 12-year-old whiskey and the other ingredients needed to create this amazing drink. The second cocktail that’s part of the kit is called the Saffron Drop. In this drink, you’ll use spiced saffron syrup, vodka, lemon juice, and spicy candied ginger. In August 2017, they gave the recipe and ingredients to make two fantastic end of summer drinks that everyone seemed to enjoy. The first was called the Mexican Mule and the second is called a Pomegranate Tequila Sour. If this explanation isn’t enough, you should definitely head over to the Saloonbox website. On the site, they tell you every box they’ve shipped over the course of their existence, so you’ll be able to see everything that has gone out their door since November 2016. 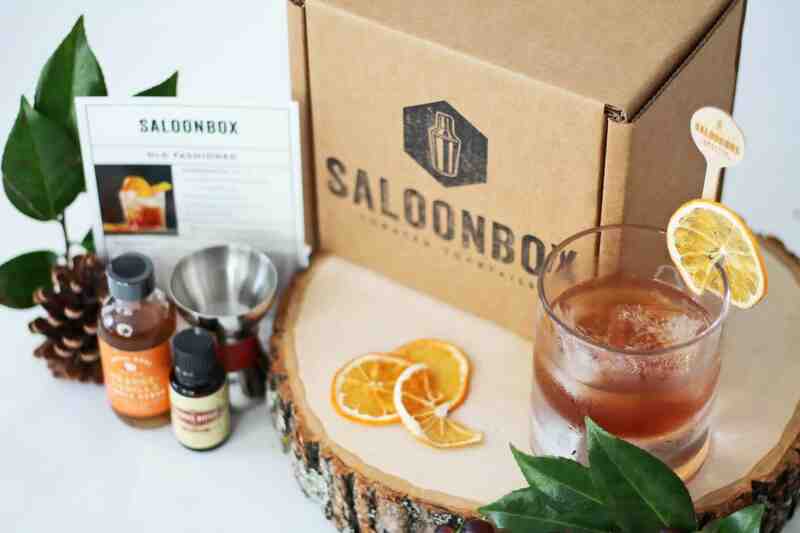 If you like mixing incredible tasting drinks, you’ll definitely love the Saloonbox subscription. Visit their site to learn more about it and start mixing unbelievable drinks today.